by Robert Buchanan and John Coleman* (partly based on Buchanan’s poem, St. Abe and his Seven Wives). London: Olympic Theatre. 7 May to 2 June, 1881. * An exchange of letters between Buchanan and Coleman in The Era during April and May, 1882, contains Coleman’s claim that he wrote the first version of The Mormons; a claim which Buchanan accepted. For further information see below. The next production at the Olympic will be a strong drama, entitled The Exiles of Erin; or, St. Abe and his Seven Wives. It will be supported by a strong company, including Miss Harriett Gay, and will be illustrated by some striking scenery, founded on sketches taken at Salt Lake City. In Act 3, which is called “Among the Mormons,” an extraordinary glimpse is given of the social life of Utah. Sir,—I see in your issue of last Saturday that The Exiles of Erin, at the Olympic, deals with Mormonism both in its pathetic and humorous light, and that the scenes are laid in Ireland and Salt Lake City, both which statements might apply to a drama of mine just finished, and which has been submitted to one or two gentlemen of the profession on whom I can call for a verification of its existence at the present date, if necessary. London, May 4th, 1881. CYRIL BOWEN. Last night a new romantic drama, professedly taken in part from “an American source,” and partly from the poetical satire, “St. Abe,” and called The Exiles of Erin; or, St. Abe and his Seven Wives, was produced at the Olympic with but indifferent success. Loosely constructed, with wild and improbable situations, jumbled with over-acted comic business, it failed after the second act to hold the attention of the audience, although at periods a good situation won applause, or an indiscreet joke won a laugh. The piece is in a prologue and four acts, and its purpose is to illustrate the manners and customs of the “much married” people of Utah. In the prologue, which supplies the motive for the succeeding acts, we have a story of seduction and death. The victim is Norah, a young Irish girl of gentle blood, and the betrayer, a disreputable fellow named Corcoran, who robs her of her fortune and casts her out on the world. Her brother, who has been transported for complicity with Fenianism, hearing of her misfortunes, returns clandestinely to Ireland, just in time to witness her death at the hands of her seducer, who escapes to America as the companion of a ruffianly Mormon elder named Swayne, a man who represents the dark side of the apostles of Brigham Young. Young Desmond resolves to avenge his sister’s murder, and starts in pursuit of Corcoran, who has become a murderous tool of Young’s, as one of his “Avenging angels.” Desmond appears amongst the Mormon emigrants as “Uncas the trapper,” a daring hunter, beloved by Indians and by Hester Fitzgerald, a young Irish lady, who with her brothers are dupes of Swayne, and journeying to Utah. Uncas too freely denounces the Mormons, and Swayne marks him for assassination; Corcoran leading on the attack, which results in the rescue of the hunter by an Indian chief. In this way the incidents, more or less sensational and exciting, progress till we are introduced to Utah, where Brigham and Swayne plot to “seal” Hester to the latter. A forced marriage is contemplated, but is interrupted by the heroic Desmond. The doings of the Mormons are depicted in the blackest colours, the Temple of the “prophet” being invested with horrors, suggesting the days of the Inquisition. In the end, of course, the heroic Desmond carries Hester through her perils, and avenges his sister’s shame. In the development of this highly seasoned fare the audience are treated to materials so over-strained as to verge on the ludicrous, and by the time the third act was reached the sympathies of the audience were estranged, and occasional symptoms of merriment were prevalent. Mixed with the sensationalism, in very little accord, are some comic scenes, which give the ridiculous side of Mormon matrimony, and these caused mirth, more by their suggestiveness than their wit. The acting was exceptionably good, Mr. Calhaem giving a grotesque sketch of Indian life as the friendly chief, and Mrs. Digby Willoughby gave force and quaintness to a good-hearted Irish girl. Miss Harriet Jay was an earnest Hester, and Mr. Redmond the trapper Uncas. The scenery was bright and picturesque. The success attending the transfer of “The Danites” to this country has apparently encouraged the hope that another illustration on the stage of picturesque adventures in the Mormon territory would be found equally acceptable to playgoers who like to have their imaginative faculties stirred into action, while their sense of moral propriety is gratified by a dramatic exemplification of the social inconveniences resulting from the adoption of polygamy. “The Exiles of Erin; or, St. Abe and his Seven Wives,” with which the Olympic was reopened on Saturday night, is avowedly a “grand romantic, sensational, and humorous drama,” partly taken from an American source and partly founded on a poetical satire, published some seven years since, and popularly ascribed to Mr. Robert Buchanan. The scene of the prologue is laid in Ireland, at Queenstown Harbour, where a Mormon missionary is inciting emigrants to select Utah as the promised land flowing with milk and honey, and a young Hibernian, witnessing the death of his sister, caused by the man who has promised her marriage, vows to pursue her murderer to the end of the earth and avenge her wrongs when he is found. The succeeding four acts and seven tableaux are localised in the American settlement of the Mormons and vicinity, and after the necessary dangers have been encountered, and the spectators have seen the hero and heroine respectively escape form imminent perils at hazardous risk of being shot and stabbed at every turn, dramatic justice is at length duly administered, and the gallant young Irishman not only tracks with success the footsteps of the man who has killed his sister, but inflicts retributive punishment on a sly and sleek Mormon elder, who, persecuting his sweetheart with remorseless cruelty, seeks to remove every obstacle to the possession of Hester Fitzgerald, a pretty daughter of Erin, induced with her brother to believe in the specious promises of the Mormon missionary. That there is no lack of melodramatic interest in the successive incidents, illustrating fanatical persecution on the one hand and continuous heroism and unwavering fortitude on the other, may be readily admitted; and, though no novelty of treatment is likely to attract the public in this direction, while “The Exiles of Erin” find a home at the Olympic, the plot of the drama affords opportunity for several effective situations rarely failing to stir the sympathies of that section of the community caring little for the study of probabilities if they can only be brought fairly within the influence of the glamour of theatrical illusion. Some excellent acting is to be noted as increasing the chances of the new Olympic drama finding prolonged popular favour. The earnestness and intelligence of Miss Harriett Jay, now to be recognised as an improving actress, could not fail to be appreciated in her embodiment of Hester Fitzgerald whose personal attractions have so terribly fascinated the unscrupulous Silas Swayne, adroitly personated by Mr. W. McIntyre. Mr. William Redmund effectively represents her lover and champion Henry Desmond, who masks his identity under the name of “Uncas the Wanderer.” Miss Lizzie Williams gives a singularly characteristic and bright portraiture of a young Irish girl, buxom in figure, and bold and resolute in disposition; Mr. Percy Compton amusingly illustrates the perplexities of Abraham Clewson, known as “St. Abe,” who finds seven wives six too many, and at length desperately and despairingly elopes with one represented in lively fashion by Miss Letty Lind. Mr. Dolman is sufficiently stern and emphatic as the Mormon leader, Brigham Young; and Mr. Harry St. Maur as one of his dupes, and Mr. J. A. Arnold as one of the instruments of his fanatical vengeance, very satisfactorily fill their respective features in the cast. A notable figure in the drama is an Indian chief called Chingachook, admirably acted by Mr. Stanislaus Calhaem, who, in a perfectly original style, links his oddities of speech with whimsical drolleries of gesture and a marked significance of facial expressions, giving to the character a thoroughly distinct individuality, and securing for the representative of this staunch and shrewd leader of the Ojibbeways a warm welcome in every scene he brightens with his presence. The principal performers received complimentary recalls at the end of each act, and at the termination of the drama Mr. Robert Buchanan appeared in acknowledgment of a summons for the author. ALTHOUGH in some quarters a disposition is evinced to be rather hard upon Mr Robert Buchanan’s new drama, produced to-night at the Olympic, it is difficult to see how praise which has been accorded to such sensational plays as “The World,” “Drink,” “Branded,” and other popular successes can be withheld from “The Exiles of Erin.” A sensational piece the new drama undoubtedly is, nor are many of its incidents much more probable than those ordinarily found in plays of its type; but Mr Buchanan’s literary talent is, of course, far in advance of that of the average writer of sensational drama, and if only in this respect “The Exiles of Erin” has the advantage. The play is founded upon Mr Buchanan’s “St Abe and his Seven Wives,” a satire which a leading newspaper declared would “do more to destroy Mormonism than any number of Acts of Congress.” In the introduction or prologue we find that the villain of the piece, Denis Corcoran, having seduced his sweetheart, discards her and causes her death. Her brother, Henry Desmond, however, arrives in time to witness his sister’s disgrace and death, which he swears to avenge. The next scene is laid in the prairie camp of the Mormon emigrants, where the villain Denis Corcoran has become one of the destroying angels, and the avenging brother appears disguised as Uncas, a trapper. On the route Uncas falls in love with a young Irish colleen, the pretty Hester Fitzgerald, whom an elder named Swayne intends to add to his Mormon harem. The action now becomes somewhat complicated. Swayne induces Corcoran to kill the trapper, who is only saved by the courage of Hester and the intervention of a friendly Indian who rejoices in the name of Chingachook. Hester now arrives at Utah, where we are introduced to the household of Abraham Clewson, St Abe, and his seven wives. Very amusing and highly realistic is this scene, in which seven real wives with real babies and real cradles, and all the domestic paraphernalia of a much married man are seen. The trapper and the Indian rescue Hester from the Morons, but the girl is recovered, and is at the point of being sealed to the Mormon Swayne when the young trapper again rescues her. A flight over the prairie follows, and, to cut a long story short, Swayne is at length shot by the trapper, who, after a hand-to-hand knife fight with Corcoran, exacts dramatic vengeance by slaying his sister’s betrayer. That such a story affords many thrilling situations such as the patrons of melodrama enjoy may be taken for granted. Parts of the play, such as a portion of the third act, will, of course, have to be pruned, but for the most part the interest of the story is sustained throughout, while the scene in the Mormon’s house is of the most humorous description. Mr R. Buchanan was fortunate in the cast selected to interpret his play. The talent of Miss Harriett Jay has already been shown both in London and Glasgow as the heroine of “The Nine Days’ Queen,” and the part of the impulsive and courageous Hester Fitzgerald is even better suited to display her at her best. Mr William Rignold, both in appearance and by his acting, quite realised the character of the handsome young trapper. Mr Dolman played the part of Brigham Young, Mr McIntyre that of the Mormon elder Swayne, Mr Arnold the villain, and Mr Calhaem the Indian. The drama was capitally mounted, and although at the end there were, as has now become almost habitual on first nights, a few sounds of disapprobation, Mr Robert Buchanan was called before the curtain and loudly cheered. “The Exiles of Erin” must not be considered more than it pretends to be—that is to say, less a political piece, lightly glancing over the question of Fenianism and satirising Mormonism, than a romantic, sensational, and humorous drama. As such it abundantly fulfils the purpose for which it was written. A drama founded upon a portion of Mr. Buchanan’s poetical satire of “St. Abe and his Seven Wives” has been produced at the Olympic, under the title of “The Exile of Erin.” With the comic story of the Mormon elder who, though married to the woman he prefers before all others, finds the presence in the same house of six other wives to whom likewise he is sealed so distasteful and destructive of domestic serenity that he faces all the risks attending the escape from Utah, and comes with the favourite wife to Europe to enjoy the pleasures of monogamy, is associated a melodramatic interest of the most pronounced kind. A pair of young lovers are members of a band of emigrants which crosses the prairies in the direction of the Salt Lake. Covetous eyes are cast upon the young heroine by a Mormon elder, and her ultimate escape from the toils in which she is entrapped is not effected without many hair-breadth escapes. In her numerous adventures the white men are her constant foes, and her chief protectors are the redskins, whose zeal on behalf of distressed virtue is only matched by their affection for the fire-water of the palefaces. There are some good if familiar scenes in the play, and the interest in it is both strong and sympathetic. Brigham Young, the Mormon Governor, is introduced in full conclave with his elders, and his conduct is painted in the darkest colours. Miss Harriett Jay, whose last appearance in London took place in “Lady Jane Grey,” now plays the heroine, a young Irish girl. Among the more prominent of her supporters are Mr. Percy Compton (a son of the well-known comedian), Mr. William Redmund, Mr. St. Maur, and Miss L. Williams. The theatres are absolutely racing with each other in their efforts to secure the attention of the public, not by excellence, but by novelty, and certainly the aim has been attained in one or two cases most effectually. The play of “Juana,” just brought out at the Court Theatre by Mr. Wills, has the double merit of not only being an interesting work upon the whole, but that likewise of having relieved us, we hope, once for all, of the abortive endeavours made by Madame Modjeska to perform Shakespeare intelligibly to English ears. ... “Juana” affords a fine vehicle for Madame Modjeska’s display of power and dishevelment, the mad scenes in the play being well adapted for the exhibition of both. The rival attraction is a play by Robert Buchanan, which is really original, and strikes a chord which, at the present moment vibrates most strongly. “St. Abe and his Seven Wives” will be most interesting to Irish intending-emigrants. St. Abe is a Mormonite, and his seven wives are the seven plagues of his life. The scene at Queenstown is amusing in the extreme, and the whole play has an Irish flavour which cannot fail to make it popular on your side of the Channel. Mr. Robert Buchanan is greatly aided in his work by his relative, Miss Harriet Jay, the authoress of the Queen of Connaught novel, from which a most successful piece was taken, which had a long run last year. With the proceeds Mr. Buchanan founded a magazine called “Light,” which failed after the issue of a few numbers, without bringing anything but loss both to himself and his contributors. He is one of the adventurous authors of the day; and at the same time that St. Abe is being played in London, brings out a piece at Brighton taken from his own novel of the “Shadow of the Sword,” the title of which contained all that is good about it, while the piece of “St. Abe and his Seven Wives,” is really striking and original, and likely to have a long run. On Saturday, May 7th, a grand romantic, sensational, and humorous drama, partly taken from an American source, partly founded on the well-known poetical satire of “St. Abe,” entitled, The Exiles of Erin; or, St. Abe and his Seven Wives, in a prologue, four acts, and seven tableaux. Henry Desmond . . . . . . . . . Mr. William Redmund. Maurice Fitzgerald . . . . . . . . . Mr. Harry St. Maur. Denis Corcoran . . . . . . . . . Mr. J. A. Arnold. Rory of the Hills . . . . . . . . . Mr. Macartney. Andy Blane . . . . . . . . . Mr. Daniels. Brigham Young . . . . . . . . . Mr. Dolman. Silas Swayne . . . . . . . . . Mr. William McIntyre. Black Jack . . . . . . . . . Mr. Tully Thornton. Nathan . . . . . . . . . Mr. Jones. Abraham Clewson . . . . . . . . . Mr. Percy Compton. Chingachook . . . . . . . . . Mr. Stanislaus Calhaem. Dacomah . . . . . . . . . Mr. Morelli. Hester Fitzgerald . . . . . . . . . Miss Harriet Jay. Norah Corcoran . . . . . . . . . Mrs. Digby Willoughby. Biddy Linney . . . . . . . . . Miss Lizzie Williams. Alice Young . . . . . . . . . Miss Belmore. This play particularly resembles The Danites. It unmistakably contains much effective matter, and by judicious cutting down might be made a success. The plot drags through a want of stage knowledge of the author. Collaboration in writing for the stage, in our opinion, is to be deprecated on many grounds as a general rule; we think, however, that if the author, Mr. Buchanan, had obtained the assistance of one well practised in the arts of stage effect and compression of plot and dialogue, he might have presented his strong dramatic situations in a far more telling form. In the prologue a good deal of Fenian business not particularly necessary to the plot is introduced, and might as well be omitted. The scene is Queenstown Harbour. Denis Corcoran, a traitor to the Fenians and to a girl, whom he has deserted, is about to take ship for America. Norah, the girl he has betrayed, implores him to go with her to a priest “for his blessing;” he responds by brutally knocking her down in the snow and exits. Her brother, Henry Desmond, enters only in time to see her die, and to vow vengeance on the villain as the vessel carrying away that miscreant is seen leaving the harbour. In the first act we find a camp of emigrants bound for Utah, with Henry Desmond, now known as Uncas the Trapper, seeking after Corcoran, who has joined the Mormons, who, in recognition of his sweet disposition, have appointed him their Destroying Angel. Desmond declares love to Hester Fitzgerald, one of the emigrants, and telling her of the abominable practices at Utah, warns her not to go there. This step leads to his attempted assassination by the order of Silas Swayne, an elder of the Mormons, who conducts the party. Desmond is saved by the timely aid of Chingachook, his Indian friend, and Hester, the act drop falling on a capital and vigorous situation. Next we find that Hester, dominated by her rather weak minded brother, has, notwithstanding that she loves Uncas, arrived at Utah, where attempts are made to “seal” her as an additional wife to the old ruffian Swayne. The humour of the Mormon life is now introduced in Abraham Clewson’s domestic quarters; he, being a saint, and blessed with seven wives, who create a babel by their clattering tongues and songs to their children. They range from No. 1, a spiteful elderly person named Tabitha, down to No. 7, Anna Maria, the latest arrival, with whom Clewson, weary of his polygamy, eventually elopes. The comedy here introduced is neither original nor delicate. It would be hardly worth the while to follow the remaining scenes, which are devoted to the alternate escapes and recaptures of Hester, her brother, and her lover Desmond, concluding with “A wild gulch among the mountains,” a well-painted set, where we find the hero about to be hung before his betrothed by the Mormon emissaries. These latter, however, with a creditable appreciation of the necessity for their own discomfiture, go off all but one, who gets intoxicated, allowing Hester to set free her friends. Desmond has a knife duel with and slays Corcoran, a la Two Orphans. To form a picture for the curtain Hester runs up on to a plank bridge, meeting Swayne, who attempts to throw her into the precipice below, but, being shot with commendable accuracy by Desmond, takes the fall himself. Mr. Redmund has for a considerable time been regarded as one of our most promising young actors. As Desmond he made an advance upon all he hitherto has done. Throughout he played with energy and pathos worthy a better piece. Messrs. Calhaem, McIntyre, and Arnold all did justice to the characters they assumed, and jointly are entitled to second honours. Mr. Percy Compton as St. Abe followed closely his father’s style of low comedy, and was decidedly successful. Mr. Dolman was preachy and monotonous as Brigham Young, and Mr. St. Maur had little to do as Maurice, and did it. Miss Jay’s heroine was admirable in the lighter scenes, but she was not powerful enough in the melodramatic portions. Miss Lizzie Williams was capital as Biddy, except that her brogue was unequal. Mrs. Digby Willoughby, who appeared only in the prologue, gave full rendering to the sorrows of Norah. Miss Clifton, as the shrewish Tabitha, and Miss Letty Lind, as the bright little Anna Maria, were good. Many lines in the latter part of The Exiles are open to doubtful construction. With these cut out, and other excisions made for the sake of closeness, the play may become a success; but we fear it is not destined for a long run. The new piece at the OLYMPIC called The Exiles of Erin; or, St. Abe and his Seven Wives, and founded on a humorous poem by Mr. Robert Buchanan, both amazed and amused those who witnessed its first performance on Saturday night. It had no doubt a certain charm of its own, for the spectator felt impelled to remain till he had seen how the extraordinary production should end. Its comic situations represent the trials of a Mormon saint, whose seven wives of different nationalities, all in full-dress, national costume, are a great deal too many for him. Difficulties are increased when he falls madly in love with one of the number, and at last he resolves upon an elopement with his own wife. The imagination which runs riot in the tragic passages of the piece is somewhat deficient in these scenes, which ought to be much firmer. Out of them a farce might perhaps be constructed, while the rest of a play, so absurd in its suggestions and its situations, might be banished from the stage, or stored away to furnish hints for some tragedy-burlesque. 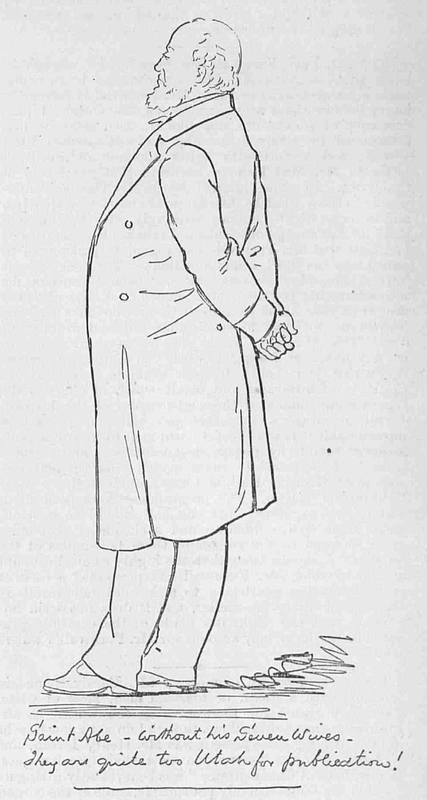 The good humour of Miss Lizzie Williams, acting as Biddy Linny, a roving Irish colleen, the melodramatic fervour of Mr. William Redmund, and the performances generally of Miss Harriet Jay, Mr. Calhaem, Mr. Compton, Mr. McIntyre, Mr. Arnold, and others of the cast received fair recognition from the audience, which, comprising a number of the class who delight in sensational scenes, were at times prodigal of applause, and were laughingly joined in their demonstrations by playgoers who manifestly treated the whole performance as a joke. In a Prologue, Four Acts, and Seven Tableaux. This “grand, romantic, sensational, and humorous drama, partly taken from an American source, and partly founded on the well-known poetical satire of ‘St. Abe,’” may, we think, be fairly called the most extraordinarily ridiculous play that has been put upon the stage in recent years. The audience that sat it through on the first night was a very friendly one, and must have suffered much for the sake of friendship. Had not this self-sacrificing spirit prevailed we fancy that The Exiles of Erin would have been howled down long before the four acts and seven tableaux had been completed. Our annoyance arose chiefly from the fact that with so many people around who, it was evident, were well disposed towards the author and his work, we could not well, without running the risk of appearing rude, indulge in a good, hearty roar of derision just in those passages of the play where Mr Buchanan intended to be most serious. In the “humorous” parts we could, of course, shed a silent tear without attracting much attention or becoming the object of tremendous frowns, but there was not much consolation or gratification to be derived from this. Once or twice we almost persuaded ourselves that to go to sleep would be the proper thing, but Mr Edward Jones, who presided over the orchestra, was a very determined foe to anything in the shape of repose. His baton seemed to direct some electric battery, and, now and again, at the sign of indifference or a slight drooping of the eyelids on the part of any unhappy individual seated behind him—he evidently knew what was going on—his musical myrmidons struck a chord which acted like a spur upon the drowsy and fairly made them jump. Mr Jones, perhaps, was not so responsible in this matter as was Mr Buchanan, for we think we shall be right in saying that the latter thought and arranged to get some fine “effects” out of his “situations” by the aid of the gentlemen with the fiddles. There was slow music and there was fast music—music that was of the creepy, ghost-like order and music that seemed to be made of fireworks and to go off with a bang. Indeed, we think it may be said that The Exiles of Erin is made up of Mormonism and music, and we are quite certain that in the way of a mixture of mirth and murder, plottings, fights with knives, and fights with pistols, schemes to assassinate this one and to marry that one against her will, to drug here, to hang there, and to carry on sorry work with the assistance of Brigham Young and a mysterious individual who is everlastingly spoken of as a doomsman, nothing so remarkable in the way of a dramatic hash has been seen since the days when there was prosperity at the Bower Saloon. The prologue takes us to Queenstown Harbour in winter. The snow falls fast just when anything startling is going to happen, and that something startling does happen may be guessed from the words in the playbill. Here they are:— “The Mormon Missionary. The Emigrants. A Marked Man. The Deserted Wife. When the Snow Falls. The Face in the Snow.” The fact is that there is a poor Irish girl, who has been betrayed and deserted by a scoundrel named Denis Corcoran. He is responsible for her death, and her brother, Henry Desmond, coming home from his wanderings and learning of the treatment to which she has been subjected, swears to be revenged, and starts in pursuit of her murderer. Corcoran, we presently find, has located in America, and has become one of the Mormon leader’s “destroying angels.” He is in the emigrant camp with the “Exiles of Erin” on the prairie. So, too, is Henry Desmond, who is now passing as Uncas, the trapper. The latter has fallen desperately in love with Hester Fitzgerald, who, with her brother, is on her way to join the Mormons. He tries to persuade her to abandon her purpose, and to avoid the society of the polygamists; but her brother fiercely rebukes him, and a certain Elder Swayne, who seems to be in charge of the party, gives orders to Corcoran to give “Uncas” quick despatch; in other words, to murder him as soon as possible. The attempt is made, but “Uncas” finds a friend in Chingachook, “an Indian, not of the type drawn by Cooper, but good-hearted and given to fire-water.” In the second act we are permitted entrance to Utah. The first scene shows us the “Prophet’s” office, with Abraham Clewson, “known as St. Abe, a recalcitrant polygamist,” pleading to be released from six out of his seven wives. The third scene takes us to this young gentleman’s home. We are allowed to go into the garden of this very much married man, and to make acquaintance with the ladies who have vowed to love, honour, and obey him. They seem to be of all sorts and all sizes, and to be proud of their nationality and their babies. For, be it said, Mr Buchanan brings on some real babies—actors and actresses in swaddling clothes; quiet, well-behaved, and seeming thoroughly to enjoy the novelty of their surroundings. There is a very lame attempt to get something like fun out of the scene by showing us “St. Abe’s” seven wives contending for the first place in his affections, and the Red Indian Chingachook indulging in encounters with the eldest of the ladies, who rejoices in the name of Tabitha. He calls her a squaw, and he thinks it the right thing to be continually squaw-ling at her. Now, it appears that Elder Swayne has made up his mind to add Hester Fitzgerald to his stock of wives, and to this arrangement “Uncas” very naturally objects. Swayne would marry her at midnight, and here we get about the most stupid scene of the whole production. Hester has been brought to the scratch by force; her brother, who has been initiated, and who has received the “pass word,” enters a protest, and is handed over to the doomsman, a funny fellow, who lifts up a trap door to show him the way to the vaults that mean death. But the doomsman presently turns out to be none other than Henry Desmond disguised. He contrives to carry off Hester, but she is recaptured, and is condemned to look on while her lover is executed. Her lover, however, is not executed. He is reserved by a benificent Providence to bring Denis Corcoran to his doom. Denis compares himself to Cæsar, and would like to “beware the Ides of March,” but he has to give up his game and to give up the ghost ere, upon “Sunrise in the Golden Valley,” the curtain finally falls. We sincerely hope we have done Mr Buchanan no injustice in our description of his play, but we think it very likely that we have got some of the incidents rather mixed. That, however, is no fault of ours. We found no natural sequence and it was impossible to make one. Love, murder, Mormonism, cradles, babies, wives, knives, scoundrels, Indians, and destroying angels pressed sorely on our memories as we left the Theatre, and we fear it must be confessed that trying to unravel the mysteries of Mr Buchanan’s play sadly interfered with the attention we should have paid to the following Sunday morning’s sermon. Miss Harriett Jay, who is called “the popular young actress,” represents the heroine, Hester Fitzgerald. She is a little crude at times, but it may be said she played her part with pleasant earnestness, and almost made us regret that she had such poor stuff to interpret. Miss Lizzie Williams is to be complimented on her impersonation of Biddy Linney, “a roving Irish colleen,” who roves all over the world with bare arms and without a bonnet. Her animation made amends for any deficiencies in the dressing of the part. Mrs Digby Willoughby, too, did well in the comparatively small part of Norah, the betrayed young damsel of the prologue. Miss Letty Lind and Miss Agnes Clifton were conspicuous among the seven wives of At. Abe, and merit special mention. Mr W. Redmund was very earnest as Henry Desmond, but we may say this young actor will do much better things when he can be persuaded to moderate his ardour. His elocution is invariably pitched in too high a key. Mr H. St. Maur was but a mild Fitzgerald. Mr J. A. Arnold gave melodramatic force to the part of the rascally Denis Corcoran, and Mr McIntyre was, as usual, very vigorous as the villainous Elder Swayne, a very remarkably unpleasant personage. Mr Dolman’s Brigham Young was what he did not mean it to be, funny; and we may say that Mr Calhaem’s Chingachook, although clever in its way, will not bear comparison with his marvellously skilful portraiture of Jacky in It’s Never Too Late to Mend. Mr Percy Compton was amusing as Abraham Clewson, the gentleman with seven wives, but it was curious to note that he fell alternately into imitations, now of Mr Buckstone and now of his own father. Mr Buchanan was called to the front at the end, but the compliment could not be considered of much value. THE new play called The Exiles of Erin, produced at the Olympic, owes its origin professedly to Mr. Robert Buchanan’s poetical satire, “St. Abe and his Seven,” and in part to an American source, which we are unable to trace. The raison d’étre, however, of its presentation is probably to be found in the success which has attended dramas of the backwoods, such as The Danites. It is of course to America that the Irish Exiles betake themselves, and the prologue of the play is occupied in showing how it is that Henry Desmond follows to Utah one Denis Corcoran, the betrayer and murderer of his sister Norah. With Desmond a certain Biddy Linney, described as “a roving Irish colleen,” is next found journeying across the prairie to Salt Lake city; but the young man has now disguised himself, and, under the style of Uncas the Wanderer, occupies himself as a trapper, winning the friendship of Chingachook the Indian chief, by saving his life. In the meanwhile the scoundrelly Corcoran has found fitting occupation as one of Brigham Young’s Destroying Angels, and in his new capacity is told off by Elder Swayne to put a stop to Uncas’s awkward interference with a caravan of deluded converts whom Swayne is guiding to the Mormon city. The young Irishman naturally objects to seeing a pretty girl like Hester Fitzgerald brought under the licentious influence of the Prophet and his elders; and, postponing for a while his revenge upon Corcoran, he constitutes himself Hester’s protector. That someone should protect her is very necessary, for Elder Swayne intends to have her “sealed” to him either by fair means or by foul. The contest thus commenced, it is carried on with spirit through the rest of the play. An attempt on the part of the Destroying Angels to murder Uncas is frustrated by the friendly Indian, a plan for abducting Hester is temporarily successful, an initiation and midnight bridal take place, and a series of struggles and hairbreadth escapes culminates in Wild Gulch, where Denis Corcoran meets his fate which he deserves, and Desmond, alias Uncas, is able to rescue Hester from Mormon clutches. In addition to the number of melodramatic tableaux thus provided, the piece has one or two amusing scenes illustrative of more or less practical phases of Mormonism. Thus, a certain recalcitrant Mormon, Abraham Clewson, who has seven wives, is miserable because he has fallen in love with one, and wants to get off the other six. The picture of this uncomfortable family party is comical enough, but one gets rather weary of the prophet’s defence of his position, and rather disgusted with the outspoken comments of some of the other characters upon the highly objectionable features of life in Utah. It is a pity that the author of the play did not more fully make up his mind what sort of audience he meant to attract; as it is, his strong sensational situations will chiefly please playgoers of a class which knows little, and cares less, about the rights and wrongs of Mormons. The Exiles of Erin is very well acted by Miss Harriett Jay, who is rapidly gaining experience; by Mr. Redmund, as Uncas; and by Messrs. McIntyre and Arnold, as villains of all requisite truculence. Mr. Calhaem, too, makes Chingachook an amusing creature, whether drunk or sober. Chingachook is scarcely a noble savage; but perhaps he is none the less lifelike a Red Indian for that. Mr. H. St. Maur represents a young Hibernian disciple of Brigham Young, Mr. Dolman makes that Prophet look like a very respectable tradesman, Mr. Percy Compton as the over-married St. Abe shows not a little humour, and Mfrs. Digby Willoughby gives graceful emphasis to the pathos of the hapless Norah’s despair. If only the play had had a more definite purpose its performance would have ensured it very fair success. Olympic Theatre.—A play entitled “The Exiles of Erin; or, St. Abe and his Seven Wives,” was produced at this theatre on Saturday. Beginning in a snowstorm on the coast of Ireland, the story pursues its course through a series of crimes, vows of love and vows of vengeance, midnight bridals, duels with knives, and flights for life, till it ends at “Sunrise in the Golden Valley,” with the shooting of a long-haired Yankee, who, after he has been shot, takes a splendid “header” from a bridge into the seething tide below. The personages are chiefly Irish adventurers of one sort or another, Irish “colleens,” Fenian assassins, Mormons, emigrants, trappers, Ojibbeway redskins, and destroying angels in the pay of Brigham Young. The actors, more particularly Mr. William McIntyre, Mr. Redmond, Miss Harriet Jay, and Mrs. Digby Willoughby, played excellently, and the scenery was bright and pretty. The play was accordingly received with great applause. 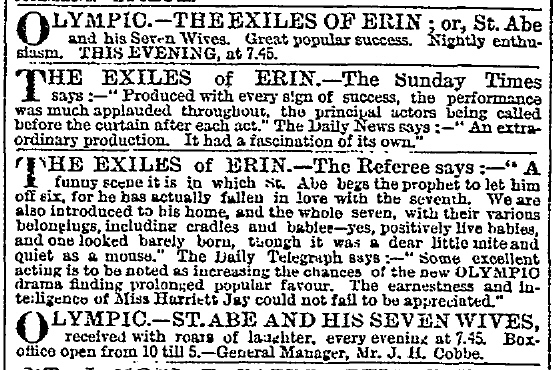 A drama called “The Exiles of Erin; or, St. Abe and His Seven Wives,” was brought out at the Olympic Theatre last Saturday night. It appears, however, that a play called “The Exiles of Erin” has already been done in England; and so the Olympic drama has been re-christened “The Mormons,” &c. Mr Robert Buchanan is the author, and the work deals in romantic style with the dangers and difficulties of the inconvenient institution of polygamy in the State of Utah. Miss Harriet Jay plays the part of the heroine, supported by Mr McIntyre, Mr. Redmund, Mr Calhaem, and others. The new play by Mr. Robert Buchanan, produced the other night at this theatre, is one of those pieces in which, to use a fragment of theatrical slang, there is a good deal of money out of London. The author is far too practical a man to suppose that “The Exiles of Erin; or, St. Abe and His Seven Wives,” is likely to hold the attention of a metropolitan public. The play is professedly taken from an American source, and supplemented by the broad humour of Mr Buchanan’s satirical poem attacking the Mormon philosophy and styled St. Abe. The work, essentially a melodrama, complicated by coarse fun, suggests Mr. Boucicault’s Irish manner, while now and again the scenes suggest the Indian tales of Fenimore Cooper and Gustave Aimard. Nor is the comic Indian which Mr. Boucicault imported into the Octoroon absent from last night’s dramatic effort. The play is in four acts, preceded by a prologue, in which we have a young Irish lady betrayed by a villain and reduced to rags, who is murdered before the audience upon her entreating that her destroyer will marry her. The assassin is a Fenian, who has betrayed the brotherhood, and has been condemned to death. Under these circumstances he is glad to avail himself of the offer of a Mormon elder to follow him to Utah. The act drop falls upon the discovery by her outlawed brother of the dead girl—the motive of the piece being the pursuit of the villain by the avenging brother. The piece now carries us to America, where we are in a prairie encampment of the Mormons, who have attracted one Maurice Fitzgerald and his sister Hester (Miss Harriet Jay). The avenger, now called Uncas, is condemned by the Mormons, and their destroying angels, with knife, pistol, and cord, are upon him, when he is saved by Hester’s rifle and an Indian chief’s tomahawk. In the next act we are plunged into the supposed daily life of Utah. We are introduced to Brigham Young, who is dreaming of the disruption of the Union and his own elevation to imperial power in the States, where he will have lived as a ruler, and after death be adored as a canonized saint. The Indian chief appears in a corded striped shirt, “worn over,” as he puts it, and is made drunk by Brigham Young; the Ojibbeway, however, recovering sufficiently to visit St. Abe and his seven wives, who, with their babies, are presented bodily to the public. Hester escaping from Utah to her lover Uncas, who is with the Indians, is of course again captured by the Mormons, aided by chloroform, while Uncas faints upon the stage. In the third act we are presented with the mysteries of a Mormon wedding, where the unwilling bride, refusing the sacrifice, she and her brother are left to the tender mercies of a masked destroying angel, who should be the villain of the prologue, but who is the heroine’s lover. They escape, only to be caught again in the fourth act, and once more finally released by the death of the early assassin at the hands of the victim’s brother, while the elder is shot through the head, virtue being left triumphant. The gloom of this final act is, however, relieved by the tearful widowhood of six of St. Abe’s wives, he having eloped with the loved seventh, while the half-dozen appeal to Brigham Young for new settlements, one of them finally pairing off with the Indian chief. It is perhaps needless to say that the piece did not succeed, although the author, in answer to some faint applause, came before the curtain. The piece is well played. Miss Harriet Jay is always intelligent, even engaging, and would under happier dramatic circumstances than those in which she has yet been seen make her mark. Mr. Redmund, as the hero, is vigorous and good, while Mr. Calhaem is quite a treasure as the Indian chief. The actor’s ability in playing aborigines is well known. Mr. Percy Compton as St. Abe, to some degree, reminds the spectator of his clever father. There have been one or two recent changes of less note in the substantial programme of our theatrical entertainments. At the Olympic, for instance, the place of Jo—that version of “Bleak House,” which Miss Lee’s sentimental crossing- sweeper has helped to make so very popular—has lately been supplied by a curious work known as The Mormons, but first appearing as The Exiles of Erin, a title discovered to have been anticipated. The author is Mr. Robert Buchanan, and the principal part is played by Miss Jay, the lady who recently figured as the heroine of the same writer’s poetical tragedy, The Nine Days’ Queen. This later work is not poetical, though certainly tragic enough, with a large mixture of comedy, or farce—the two are now so closely allied that it is sometimes difficult to distinguish them. The piece aroused a good deal of laughter on its first appearance, sometimes in the comic scenes, sometimes in the tragic. “The Mormons,” which was produced at this theatre under a title which, we believe, was claimed by another playwright, is a melodrama which will do nothing to increase the reputation of its author, Mr. Robert Buchanan. It is quite true that it is not destitute of incident and situation; but these factors are not employed in anything like original fashion. There is a certain amount of interest in the story, but the manner of unfolding it is commonplace, while some portion of the acting of the piece is of an unmistakably weak order. The drama in itself is a fierce attack on Mormonism. We have been accustomed to view the doings of the polygamists of Salt Lake City as violators of the Christian law, but not as outrages which the perpetrators bring about by a heap of wicked plannings and plottings. Mr. Buchanan would teach us, however, that the Mormon husband is not the take-things-as-they-come kind of individual that we, in our charity, have estimated him to be, but that he is a deep, designing man, who is constantly prowling over maiden ground, seeking whom he may devour. The Mormon villain of Mr. Buchanan’s piece is first encountered in Ireland, where he is entrapping the unwary, and in the latter portion of the drama we see him trying his hardest to become the husband of the young heroine with her brother, has been persuaded to journey to Utah. The distinguished Elder is, at this crisis, shot by the virtuous lover of the young lady, who is at that moment threatened with violence by her persecutor, and his fall from the bridge over the chasm is a most creditable performance. This part is played with much melodramatic vigour by Mr. William McIntyre, whose manner is, if anything, a little too deliberate. Not only this, but one would suppose that the man who would like to win the good opinion of the fair would not make himself unnecessarily repulsive. There is no occasion for Mr. McIntyre to take the audience into his confidence, and proclaim from the commencement by his make-up that he is an unmitigated scoundrel; one would suppose that he could let his audience into this secret without resorting to a device which has inconsistency written on the face of it, for, as we have before hinted, it is not probable that any man would go wife-hunting garbed in a fashion more calculated to repel than to conciliate. The person who applies to fill a situation does not go to an employer with dirty hands and face, and with the very worst of his credentials; neither does the man who wishes to be looked upon with favour by a young girl, present himself in such a manner as would make his case a hopeless one. Mr. McIntyre is one of the most vigorous of all our melodramatic actors, and we are sorry to see him make such a mistake. Mr. W. Redmund, as the lover, plays in his usual earnest but rough-and-tumble fashion. This gentleman seems to be always in too great a hurry; there is not even a smack of elegance in acting so destitute of repose. Mr. Calhaem plays the part of an American Indian Chief in his own peculiar manner, and on those lines which he followed many years ago. Mr. Dolman, as Brigham Young, is so austere that one can hardly imagine him guilty of those playfulnesses with which his reputation is debited. Mr. J. A. Arnold plays a villainous part in a picturesque style; Mr. H. St. Maur makes but very little of his allotment, but Miss Lizzie Williams utters her speeches with all necessary point. The heroine is represented by Miss Harriet Jay, a lady of whose acting we were not able to speak altogether favourably when she was playing at the Connaught Theatre, in a part which suited her very much better than does that which she is now treating. Miss Jay possesses good looks, is most modest, and at quiet junctures can pass muster; but when strength is required she is totally unable to supply it. The comedy phases of this work are of a very flabby nature, and although Mr. Percy Compton tried his hardest with the materials, he fails to remove them from the paths of melancholy. At the Olympic Theatre Mr. Buchanan’s new play, The Mormons; or, St. Abe and his Seven Wives, may be seen working nightly. I have not left myself much space to speak of it, and, indeed, I do not feel inclined to say much in any case. I have not a programme by me, and the company, with the exception of Mr. J. A. Arnold, in a very new red shirt and a very old drunk, Mr. Redmund, Mr. Calham (very amusing as a Red Indian, with his shirt outside his trousers), were quite unfamiliar to me. Miss Jay and another lady went about prairies in highly fashionable costumes, the other lady (I crave pardon for not knowing her name) wore a costume buttoned down the back that must have been highly inconvenient when her maid did not happen to turn up at the right settlement or wigwam (“Teepee” I think is the native title) within a day or two. Mr. Buchanan has built upon his very clever book a not-at-all clever drama of The Danites class, and one hears so much of destroying angels and calamities of one sort or another, and sees so many wives flitting about the same old gentleman, that it is somewhat disturbing for a time at least. Robert Buchanan, the poet, has produced a play called “The Mormons.” It is a dramatised version of a poem published some time ago in the “Gentleman’s Magazine.” Miss Harriet Jay, his niece, and authoress of the “Queen of Connaught,” appears as the heroine. The critics do not like Buchanan, and are making a dead set against him. According to the papers, therefore, the play is a failure; if the rapturous applause of big houses may be taken to mean anything, it is a marked success.